Posts Tagged "Seen on Scene Collage"
Home » Posts Tagged "Seen on Scene Collage"
Seen on Scene 2. Fashionistas photographed backstage at New York Fashion Week for Spring 2017. Top Left To Right: Chelsea Reynolds, Video Journalist, NY1 News, with her hair braided by Matt Swinney, Evolution for L’Anza … Blue earring on L’Anza’s Manny Rolon, Creative Director at Ammon Carver Studio, NYC … Steven Leff, Fashion Show Producer, with model Casey Clare, hair by Edward Tricomi, Warren-Tricomi … Warren-Tricomi hairstylist Zachary Rej Morad (@ZacharyRej) … Sponge set red coils on Voodoo makeup artist Kinshara. 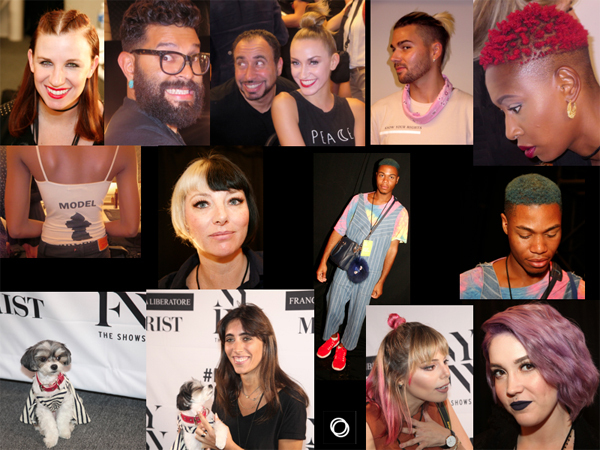 Middle Row, Left to Right: Tank top with “Model” on it worn by a model backstage… Love the half blonde, half black bob on Kyrolan makeup artist, Kelly Thompson (cut and color by Gage, Dramatics, West Village) … Omari Francis, Fashion stylist (@stylingbyof) with green/blue hair wears a vintage tie dye shirt, Zara Jumpsuit and bag, fur charm from Francesca, Nike flyknits.